One of the most legendary athletes in the ancient world, Milo of Kroton, wore the victor's crown at Olympia no less than six times. Born in southern Italy, where Greece had many colonies, Milo won the boys' wrestling contest in 540 BCE. He returned eight years later to win the first of five consecutive wrestling titles, a feat that seems incredible by modern standards. Rarely do modern-day Olympians compete in more than two or three Olympiads over the course of a career. Much like the boxer George Foreman, Milo resisted retirement: By the time of the 67th Olympiad in 512 BCE, Milo was probably forty or more years old but he competed anyhow. The challenger won not by overpowering Milo, but by avoiding the older wrestler and wearing him out. According to our ancient sources, Milo enjoyed showing off his unrivaled strength. For instance, he would clasp a pomegranate in his hand and have others try to take it away from him. Even though he was holding it so tightly that no one could remove it, he never damaged the fruit. Sometimes, he would stand on a greased iron disk and challenge others to push him off of it. Another of his favorite exhibitions was tying a cord around his forehead, holding his breath, and breaking the cord with his bulging forehead veins. Other times, the wrestler would stand with his right arm at his side, his elbow against him, and hold out his hand with thumb pointed upwards and fingers spread. No one could successfully bend even his little finger. Milo excelled even in warfare. 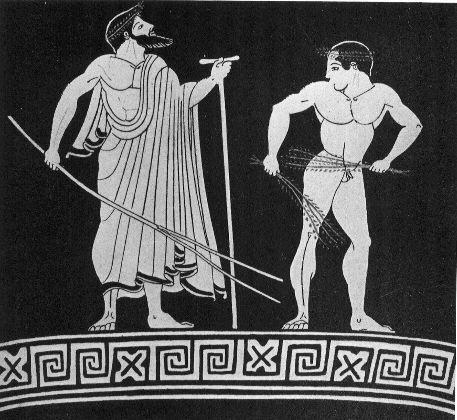 When a neighboring town attacked Kroton, Milo entered the battle wearing his Olympic crowns and dressed like Herakles, in lion's skin and brandishing a club, and led his fellow citizens to victory. A follower of the famous philosopher Pythagoras, Milo once saved his friends. It happened that the roof of the hall where the Pythagoreans were meeting began to collapse. Milo stood and supported the central pillar until the others escaped to safety and then dashed out, saving himself. In the end, however, all of this fame and strength did not save Milo from a less than glorious death. Milo was wandering through the forest when he found an old tree trunk with wedges inserted into it. In an attempt to test his strength, Milo placed his hands and, perhaps his feet, into the cleft of the trunk and tried to split apart the wood. He succeeded in loosening the wedges, which fell out, but the trunk closed on his hands, trapping him. There, according to the tale, he fell prey to wild beasts.